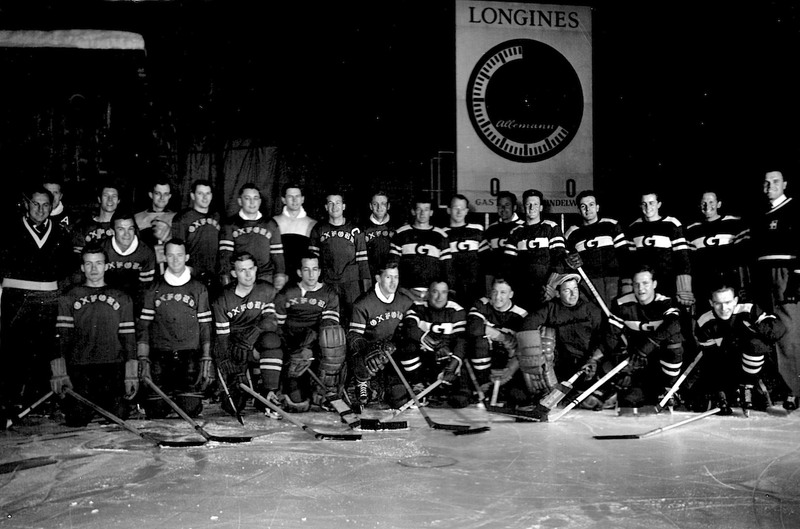 The 1954 Oxford touring team, left, poses with the home team in Grindelwald, Switzerland. The Swiss won the game that followed the photographing, 7-3. David Harley wears the C for Oxford; Denis Smith is third on his right. I went to see David Harley a few years ago to talk hockey, which he was always happy to do, even though, as he told me that day, he didn’t have much time for the game we see now in the NHL. The two hours we spent going through the pages of a 50-year-old scrapbook of his took us far away from that, to another version of the game in another time, games played long ago at rinks in Grimsby and Blackpool and Southampton and in the frigid open air of Mannheim and Bolzano and Garmisch-Partenkirchen. He was a lawyer in Toronto, and that’s where he lived for most of his life, but he was a proud New Brunswicker all that while, born in Saint John, schooled in Rothesay. I’m sad to write it: he died on September 1 at the age of 83. He was one of my father’s best friends, a man of immense kindness, good humour, and enthusiasm. Seeing how he conducted himself in the world I always thought, yes, right, that’s how it’s done. He was a very good athlete. He played rugby at the University of Toronto, where he captained the varsity team while completing undergraduate and masters degrees in History. He went to Oxford as a Rhodes Scholar, and that’s where he got his law degree, at University College. He had his skates with him there, and with my father, Denis, who was studying Philosophy, Politics and Economics, he skated for the varsity hockey team. Both of them would end up as captains of the team before they returned home to careers and families. I read about the 1955 match in his scrapbook. The Daily Express account wasn’t one I knew. Teammate Ian MacDonald was “the cool executioner,” scoring four goals in two minutes. He didn’t stop there: he had nine to his name before the game was over. “Hapless Pettigrew,” the paper called the Cambridge goaltender, John, a friend of my father’s from Montreal. Friendship could be why he limited himself to putting just four pucks into the net. John Duby, a defenceman, was the only Oxford player who didn’t notch a goal. David scored twice. In the program, he’s identified as “the club’s leading playmaker.” Over on the Cambridge page, all the players’ nicknames are noted: Gru, Weevil, Buck, Kipper, and Harry the Horse are some of them. Final score: Oxford 29, Cambridge 0. There’s never been a bigger whomping in all the history between the two teams. David Harley, with his rink-length scoring dashes, was the man Cambridge could not hold. He scored Oxford’s first four goals — assisted in two others, and then cracked home the eleventh in the final seconds. 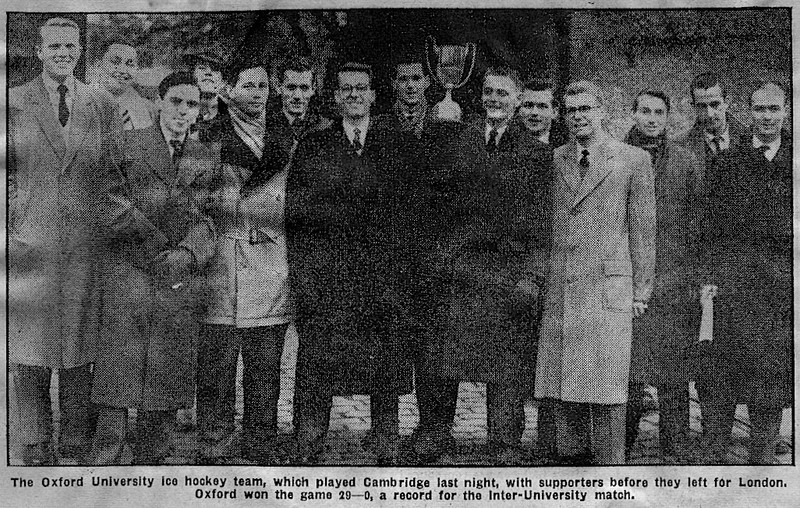 Oxford’s 1955 Canadian Cambridge-whompers pose with the inter-varsity Patton Cup. Left to right, they’re Guy MacLean, John Duby, team manager Paul Fritz-Nemeth de Freidenlieb, unknown, Alex McIntyre, unknown, David Harley, Denis Smith, Ian Macdonald, Ian Stewart, Otto Lang, Storrs McCall, John Lewis, and Roy Morrison. What a lovely note. Truly beautiful. On good news front, Mike’s deal is a go!